Sticking with the "minimalist" theme here. 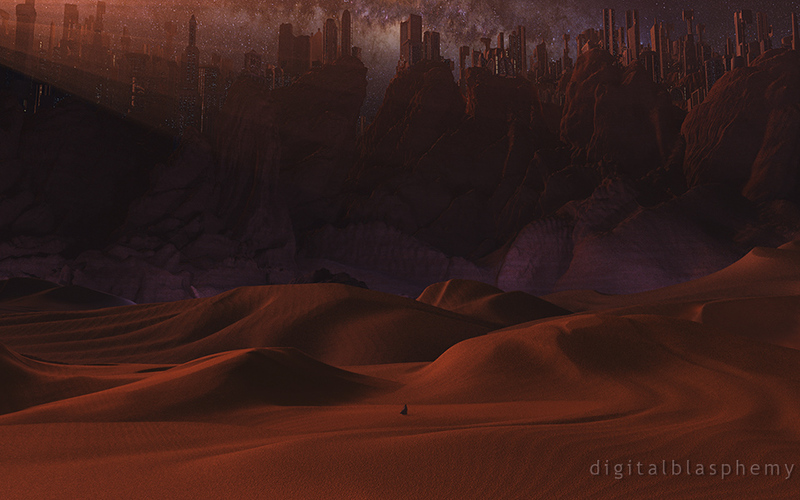 This piece was inspired by one of my all-time favorite novels: Frank Herbert's "Dune". I realize it is a bit dark in spots, but I wanted a good deal of shadow between the desert and the Shield Wall. Just picked up the novel myself and I'm loving it, so I need to get this wallpaper. Thanks and keep up the good work. This just came up on my desktop cycling again. Having recently played Journey, this really reminded me of that game. Ryan, you've really been turning out some stellar work this year. I do prefer this to the day version as it is a little bit more moody. I doubt I will do another version but you are welcome to download the triple-screen and slice it up however you like. Seeing the multi-screen version now I think the best part is more to the left by the sun. Could you make a pickle jar version of a single screen panned to the left? I love this one. I hope you continue to do pieces based off sci-fi and fantasy literature. Any chance of getting the figure into more of the multi-screen renders? I noticed he got cropped out of the Dual 1080 image. The Pickle Jar Zip files should be be fixed. Thanks for the heads up!! Now here's a challenge for you - Now do Caladan and Giedi Prime! Great picture, not really how I envisioned it but it's great to have someone else's take on it. PS I always thought the Original film was absolute rubbish! Love the red sand. Makes me think of Mars. The sand looks off to me,, other then that I like it. Can't wait for the dual-screen version! You might consider changing the robe on the little guy to a Stillsuit? Very nice! Have you ever read Arthur C. Clark's Rendezvous With Rama? You would make a great visualization of that ship interior! Now that's a nice image. It invokes so many feelings all at once! Great job! Love everything about it. A little grainy at the top but can live with it. This is the first image in a while that for me has the classic DB touch to it. LOVE this idea! frank herbert and his Dune series has permanent placement on my bookshelves (his son carried on the tradition quite well, i might add). The multiscreen is rendering now. Hope to have it up this evening or early tomorrow. Love the image, especially the cityscape. The graininess works with the content, after all sand is pretty grainy! My eyes keep catching on the top of the dunes and the sudden colour change to the wall behind - makes it look like a set of dunes with a painted backdrop rather than the dunes stretching out to meet the base of the wall. I wore out my first copy of Dune and had to buy another. Terrific piece -- I particularly like the city on the cliffs. Great Mother, Ryan! You're worth ten times your weight of water! Fantastic. Every couple years I pick up Dune just to read a chapter or two and end up reading the whole book again. Thanks for reminding me what I'm doing for the next few days. Cant wait for the dual-screen. This piece has just the right lighting for my iPhone lockscreen and background. Well done Ryan! Also a big fan of Dune. 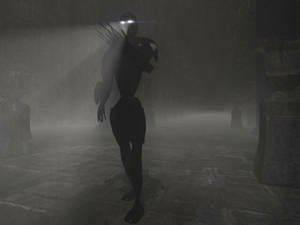 Like the piece a lot - the lighting, the patterns, the shadows, the lone figure. Would also love to see a version with just the endless dunes, as well as the multi-screen. I actually really like this piece. But, it makes me want a piece without the buildings or the rockface -- just a desert piece. I love the look of the sand, the lighting level... just terrific! Huge fan of the book, and of this piece. The buildings on top blend in perfectly to the mountain side, the lights inside are just enough to draw attention but not keep it. Can't wait for a multi-screen version. What, no worms? LOL Love Dune. PS. Great image ... Really captures the feel! Generally, desert is not my scene... and if a desert is necessary, there better be a few palm trees in there. But this one isn't just visually appealing, it speaks to me in depth. I don't exactly understand what I feel when I see it, but it's post-apocalyptic/Ray Bradbury-esque feel almost makes it... frightening. Beautifully frightening. I haven't ever commented on any of your work, despite being a member for over a year and a half, but I was struck by the simple beauty in this render. Keep it up Ryan. Oh my.. This is awesome ! It's like some of your older work. Simply gorgeous..
Looks good. I think the mountain side is a bit too dark though, would be good to see some more detail in the rockface. The sand looks very grainy as well, not very smooth. Not much of a fan of the sun glare in the top left corner either. I thought Journey, not Dune. But then again, I've played Journey more recently. Dune is amazing and this is a great vision of it. A mid-day version would be really interesting. I also loved the book "Dune" although it has been many years since I read it. I can see the inspiration from it. I also think a mid-day version would be interesting. Like the light & ambient. Love Dune, too! I like the idea and layout, but I wish the haze were reduced. I think it would be much more striking if the light could really show the difference in texture between the sand, rock, and structures, but it kind of gets lost in the fuzz. Loved the Dune series! I can definitely see the influence in this image. Absolutely your best work yet! Awesome all around. I never saw Dune, but this reminds me of Judge Dredd. I love the depiction of the "Shield Wall". I can definitely see the inspiration from Dune in this. I think the shadows add to the imposing nature of the shield wall. I think perhaps a mid-day scene would be interesting contrast to this twilight scene.